The Museum needs help from your kids to build and decorate the dinosaur. 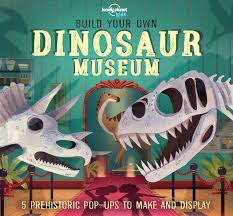 In this book, the kids can use the paper models (see pic at right) provided to build a pop-up dinosaur models (5 dinosaurs in total) to turn the book into a pop-up book. The kids can also help to put the egg fossils and teeth and Poo Poo into the right display cases. 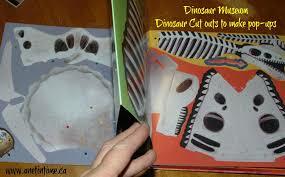 The kids will enjoy this DIY experience and also learn a lot about dinosaur by doing the book themselves. The illustration is adorable and uses vibrant colors which are very attractive to the young readers. The words are easy to understand. The book covers the topics like how to define dinosaurs, the characteristics of plant eaters and predators, and the reason of the extinction of dinosaurs. 12. Where in the world? Both my son and I really enjoy this book and we highly recommend this book.